Phase 1 of the Camden, NJ book donation project is complete. Success Won’t Wait delivers almost 2,000 books! – Success Won't Wait! Phase 1 of the Camden, NJ book donation project is complete. Success Won’t Wait delivers almost 2,000 books! 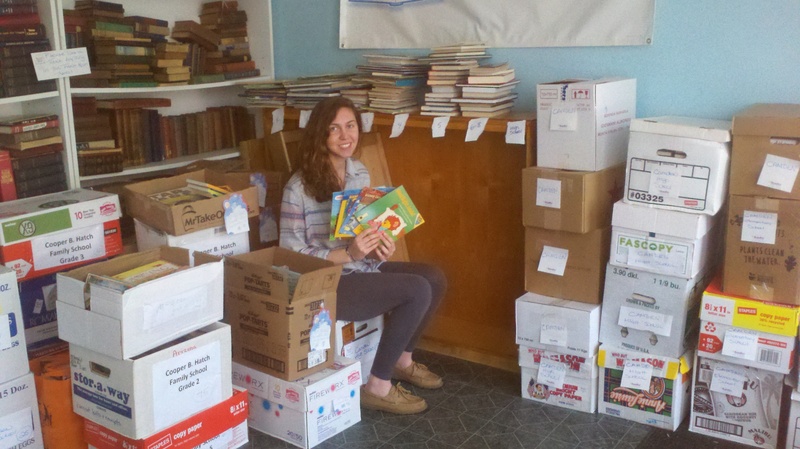 Success Won’t Wait volunteer Christine McNeill with just a few of the books which were donated to Camden, NJ schools. Earlier this year, longtime Success Won’t Wait volunteer Christine McNeill began an exciting project to help the K-12th grade schools of Camden County, NJ. Her goal? Donate 10,000 books to the various schools in the county for in-classroom mini libraries, as well as for school library expansions! 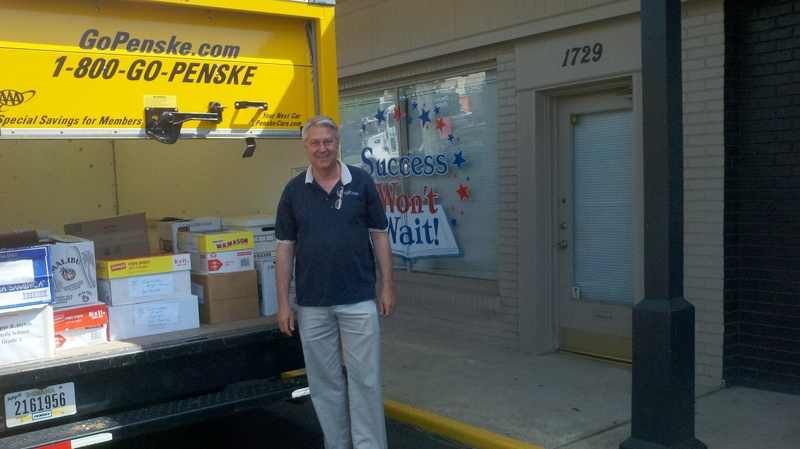 Volunteer Donald McNeill loads the truck with books destined for Camden, NJ. 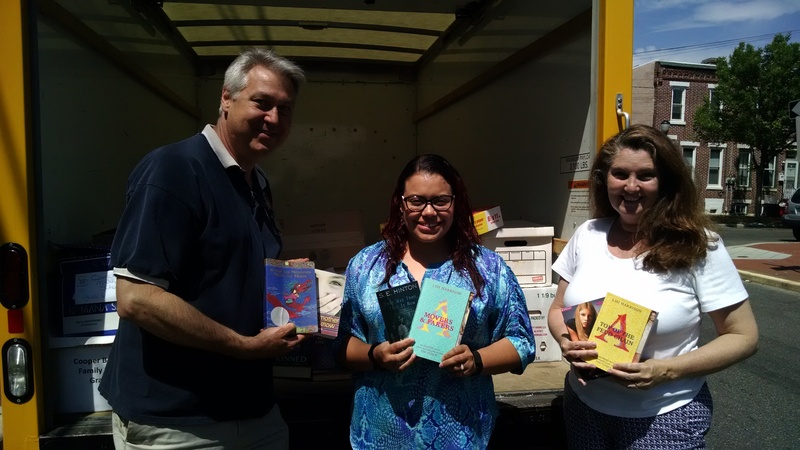 This week, Phase 1 of the project was completed as Success Won’t Wait volunteers delivered almost 2,000 books to the Administrative Center in Camden, NJ. A special shout out goes out to Penske Trucking in New Castle, Delaware. The folks at Penske are great supporters of the Success Won’t Wait mission and often provide trucks for reduced rates to help keep costs low. We could never transport the number of books necessary without their help! at the Camden City School District. Books donated this week includes a wide variety of titles for kids of all ages — everything from popular series like Cam Jansen, The Magic Tree House, and Harry Potter, to historical biographies of important Americans, sports stats, and even Ripley’s Believe it or Not! In addition, this first phase of the donation included books for Camden middle schools and high schools, as well as adult fiction, non-fiction, and self-help books for two new proposed Parent Centers in Camden. This is wonderful progress… but, we need more! So, we are asking our loyal followers and donors to please share this project with family, friends and coworkers. The most urgent need is for high quality books appropriate for grades K-5. For more information on donating, please call Christine McNeill at 302-388-9669. Thank you for supporting our mission! Founded in 2002, Success Won’t Wait, Inc. is a 501c3 non-profit literacy organization based in Wilmington, Delaware. To volunteer or to donate new or used books in Delaware, please call 302-388-9669. Previous Brownie Troop #5404’s book drive yields over 500 children’s books for Success Won’t Wait’s literacy projects! Next Success Won’t Wait donates 1,000 books to the Friends of the Wilmington Library. Project total now tops 5,000 books!